Stone Ridge, N.Y. - Picture a ten-foot stainless steel cube, balancing on its edge. The sky and surrounding area are mirrored in the metallic sides of this beautiful piece of modern sculpture. Suddenly the door opens to reveal a comfortable, soundproof recording booth. Welcome to The Cube. 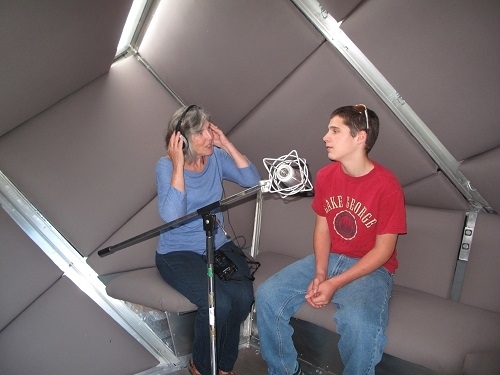 The Sound and Story Project created The Cube to collect the stories of everyday people throughout the Hudson Valley. 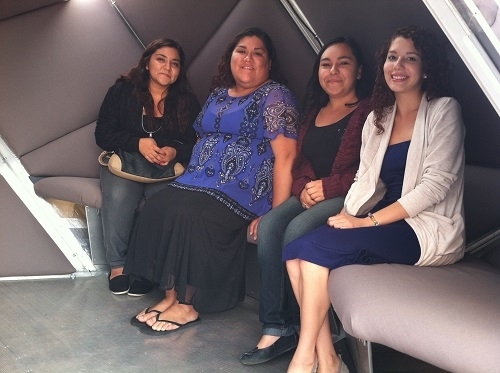 “We’ve always dreamed of collecting stories in our city parks, at library fairs, street festivals or farmer’s markets. This fall our dream becomes a reality when The Cube hits the road. Because it can be constructed and dismantled in hours, we’ll be able to travel from town to town recording interviews.” says Sound and Story Director Eileen McAdam. 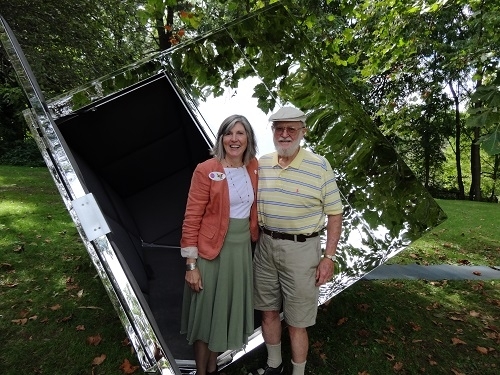 The Cube’s journey begins on September 15th from 1:00 PM to 3:00 PM at The Stone Ridge Library honoring community member Bill Davenport with the inaugural interview. Tour The Cube, enjoy refreshments, hear local stories, and learn about your community at this free, family friendly event. The Cube will remain at the Stone Ridge Library through September 17th. Community members who wish to have their personal stories recorded in The Cube should email soundandstoryhv@gmail.com to reserve their spot. Hudson River Valley Heritage (hrvh.org) will archive the collected interviews and preserve them for future generations. The Sound and Story Project will feature stories from The Cube on their new app and online during A Year of Sounds and Stories beginning in January 2014. Next stop for The Cube is the Hudson River Maritime Museum on September 19, 2013. Visit soundandstory.org and Facebook.com/soundandstory for more information and The Cube’s schedule. This program is funded by the Institute for Museum and Library Services. The Sound and Story Project of the Hudson Valleyis a program of the World Sound Foundation, a 501 c3. Our mission is to strengthen community through the power of listening. By sharing the stories of the diverse residents of this region, we become more strongly connected to one another and to places where we live. Using original recordings, supplemented by library and museum collections, we produce compelling narratives and sounds of the world we inhabit. We disseminate this growing audio archive through the latest digital technologies and new and traditional media including radio programming, mobile applications, audio tours and web presentations. For more information about the Sound and Story Project of the Hudson Valley, visit www.soundandstory.org. The Stone Ridge Public Library is a special district library located on Route 209 in Stone Ridge. Located in a historic stone building, the library has been in existence since 1909. In 2000, the Library became a special district library, supported by the tax payers of Marbletown. The Library is administered by a nine person Board of Trustees, elected by Marbletown residents. HRVH provides online access to historical materials from New York State's Hudson River Valley.